Gutter Cap is a metal dome system that covers the gutters. The majority of rooftop debris is shed by the wind, while the remainder is shed during the rain. The rainwater is still able to navigate through the gutter system by means of water surface tension. The rainwater adheres to the rounded metal contours of the panel and drains into the gutter once it hits the straight edge in the trough system. Some debris will pass through the system, but there is plenty of room in the patented channeling system for the debris to be flushed out of the downspout. Why should I choose Gutter Cap over other products? There are subtle differences in the Gutter Cap design that make it superior to other products. Gutter Cap is made of an X-10 metal alloy for sturdiness. The panels are painted with a Kynar finish and will not fade or chalk. The finish on the majority of the other systems will bleach out within 2-5 years. There are no vertical openings in the panel for debris to fill in or mesh together, clogging the system. The system is low profile and with proper color matching to the roof, almost invisible. The warranty is double lifetime for materials, performance, and most importantly, labor. How much will the cost be to install Gutter Cap on my home? Gutter Cap dealers only quote exact figures. Beware of companies that will quote over the phone. There are far too many variables involved such as pitch of roof, type of roof or gutter, conditions of gutters, number of inside and outside valleys, etc. Hence, pricing can only be determined by a visit to the home and inspection of the roof and gutter system. Free no-obligation quotes are available at your convenience. How much rain can Gutter Cap handle? Almost every gutter protection system can handle what ever Mother Nature can dish out in terms of volume of rain fall. 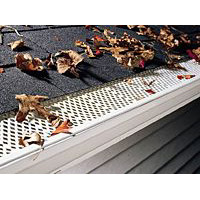 The real focus should be on whether the gutter protection system will clog. That's when rain-flyover is a problem. Most systems will eventually clog, but Gutter Cap will not. So rain flyover will not be an issue.What kinds of roofs can Gutter Cap be installed on? Gutter Cap can be installed on asphalt, metal, flat, slate, cedar shake, and under proper conditions half barrel tile roofs. Pitch usually isn't an issue since Gutter Cap has even been installed on steep Mansard roofs. Will the installation of Gutter Cap under my second row of shingles void my roof warranty? There is a great deal of propaganda being spread by our competitors that are envious of our superior mounting system. We don't know of any case where a gutter Cap dealer has had an insurance claim filed for a leaky roof. Common sense dictates that it shouldn't be a concern. Your roof wasn't glued on. It was nailed. We have sent our installation techniques to the four major roofing manufacturers. They are satisfied that our installations methods will not compromise the integrity of the roof. Does Gutter Cap prevent ice-damming? Gutter Cap will minimize ice-damming under the fascia or under the first row of shingles. This is because Gutter Cap is mounted over the first row of shingles and under the second row. Ice-damming under the second row of shingles is uncommon because there is insulation under that portion of the roof, and the melt-freeze cycle is less likely to occur in that spot. But you will see Icicles sooner with Gutter Cap, as you would with any gutter protection system. Formerly, the ice had to fill the gutter first before spilling out over the gutters. However, considerably less damage will occur with ice on top of Gutter Cap than when it was in the gutter. Only Heater Cap will totally eliminate ice-damming in the gutter area. What is covered under the Gutter Cap Warranty? The one page double-lifetime warranty is clear and forward to the point. You will never get up on a ladder again to clear your gutters or unclog the Gutter Cap system. You will not be required to perform routine maintenance nor pay service fees to have problems fixed. Unlike the majority of the gutter protection systems available, you will not find any "weasel clauses" rendering the warranty useless. 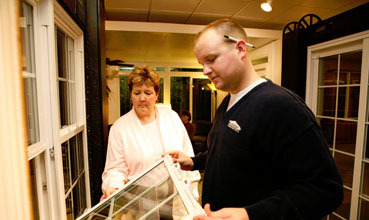 The warranty is transferable to a new homeowner one time at no charge. I've seen a lot of other types of gutter protection products out on the market. What can you tell me about those? How Does Gutter Cap compare to its competitors? They tend to collapse at the bending points, due to the weight of snow and ice. A lot of expansion and contraction during the months of winter and summer, can lead to shifting of the panels away from their clip systems and into the gutter. Warp and discoloration may happen due to the heat. Critters can and have chewed through vinyl products. Generally speaking very weak warranties. Can't handle the rain water flow like Gutter Cap. Often times the vinyl endcaps, will not come with them to keep out unwanted animals. Cheap to install and cheap on performance. A homeowner has to replace their gutters even if they're in good shape. If any section is damaged due to hail, roofers, or homeowner related, the whole cover or cover and gutter must be replaced vs. Just a 5'section. One piece systems do not use soffit and fascia. Where's the protection for the existing wood? Some one piece systems use 3" gutters. The capacity of water flow is cut in half. Please enter the number 36496 in the box provided below.